In the United States, approximately 25 million K-12 students ride the bus each way during the school week, according to the American School Bus Council. Children can incur injuries when getting on and off the bus, especially when they walk in the “danger zone,” 10 feet in front, behind and on either side of the bus. That area near the bus includes blind spots where the driver cannot see someone. Most school buses don’t have seatbelts, so children can get hurt from any forceful stop or similar motion that propels their body to make impact with part of the bus or another passenger. When walking down the aisle to find somewhere to sit, children can trip and fall due to a slippery bus floor or an object lying on the ground. 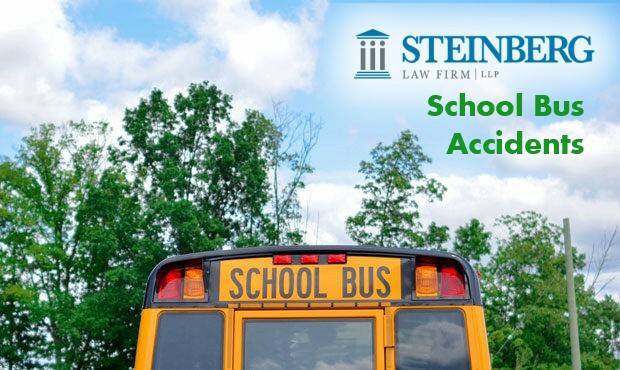 Whether the accident was the fault of the bus driver, the bus company, the school district or someone else, they can be found liable for the injuries and trauma your child experienced. The compassionate lawyers at Steinberg Law Firm can discuss your case with you and ensure your family gets the justice and compensation deserved. For a free consultation, contact Steinberg Law Firm at 843-720-2800.